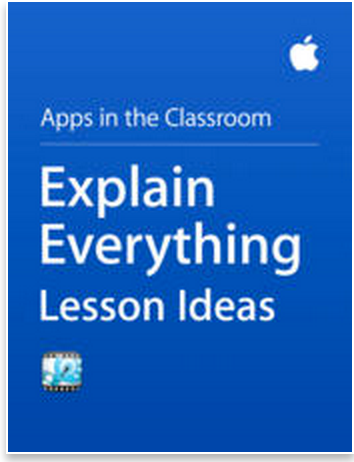 Explain Everything Lesson Ideas is a free eBook created and provided for free by Apple. This work is part of Apple's" Apps in the Classroom" project that aims at helping teachers make the best of educational apps in their instruction. Each of the guides included in this project centres around a popular educational app and provides examples and ideas on how teachers can use it with their students in class. Today's guide is on the popular screencasting and whiteboard app Explain Everything. Explain Everything Lesson Ideas is a short interactive guide that offers a wide variety of ideas and tips on how to use Explain Everything app with students in class. It actually outlines 6 basic activities that span different age ranges and subjects: Literacy, Science, Mathematics, and History. These activities are designed to help students leverage the power of this app to think in new ways. They also help them take a creative approach to applying and demonstrating what they are learning.